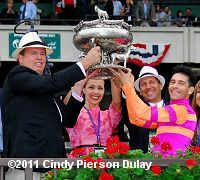 Owners George and Lori Hall, trainer Kelly Breen, and jockey Jose Valdivia Jr. celebrate with the trophy after winning the 2011 Belmont Stakes. The $1 million Belmont Stakes (G1) is the final leg of American racing's Triple Crown and the highlight of the New York racing season, contested at the marathon distance of 1 1/2 miles, one complete trip around the main track at Belmont Park. A field of 12 three-year-olds went to post in the 143rd "Test of the Champion" before the relatively small crowd of just 55,779 fans on a damp Saturday afternoon with temperatures near 70. As expected, Kentucky Derby winner Animal Kingdom was sent off as the 5-2 favorite off his fast-closing second place finish in the Preakness Stakes 3 weeks back. Nehro, unraced since finishing second in the Derby 5 weeks back, was the 9-2 second choice over 6-1 Master of Hounds, 5th in the Derby and shipping in from Ireland. 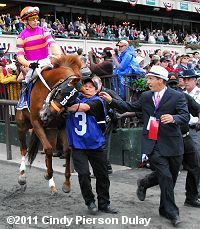 Preakness winner Shackleford was all but dismissed as the 13-2 fourth choice on the board. Ruler on Ice takes the lead over Stay Thirsty on the rail and Brilliant Speed on the far outside. At the start, Animal Kingdom bumped with 8-1 Mucho Macho Man, almost unseating jockey John Velazquez who lost his left iron, but about 1/16 mile into the race he was able to regain the iron however the poor start left him dead last, spotting the field 14 1/2 lengths. Shackleford broke sharply and was angled to the rail by jockey Jesus Castanon to set the pace and he got easy early fractions of 23.92, 49.08, 1:14.51, and 1:39.95 while 2 lengths in front of 25-1 Ruler on Ice who stalked him in second, with 16-1 Stay Thirsty sitting behind them third. On the turn, Shackleford stubbornly held the lead getting 1 1/4 miles in 2:05.09 but he was shortening his stride, allowing Ruler on Ice to inherit the lead at the 3/16. Ruler on Ice held off Stay Thirsty the length of the stretch to win by 3/4 length in a time of 2:30.88 over the sloppy track. It was another 1 1/2 lengths back to 11-1 Brilliant Speed third, while favorite Animal Kingdom put in a mild rally late to get 6th beaten 9 1/4 lengths. Left: Owners George and Lori Hall lead Ruler on Ice down Victory Lane. George Hall said, "The funny thing about this horse is that Jose would always come back and say he was goofing off, but he wasn't really tired. After the Tesio, we figured, what better race to come back than the Belmont. Jose did exactly what we asked him to do and stayed close to the lead. You could see after the race, he wanted to do another victory lap. I think he's a much better horse than the odds showed, and he proved it today." Wife and co-owner Lori Hall added, "I'm still shaking. It was amazing because we really were the underdog." 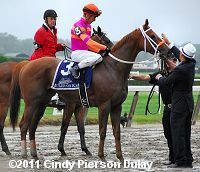 Right: Ruler on Ice in the winner's circle. Left: Ruler on Ice did not like it when they started playing "New York, New York" and spooked. 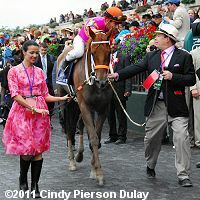 Trainer Kelly Breen is on the right reaching for him. Breen, celebrating his first Triple Crown race win, said, "He wouldn't grow up. We were trying to see if with time he would mature without having to put blinkers on him. We were disappointed in the Tesio because we were looking at the Preakness, but maybe it was a blessing in disguise. Ever since he ran at Sunland Park, he came back with low red blood count and it showed in the stall and it showed in the feed tub. It took a little time to get back to normal. After the Tesio, I thought he came back from the race somewhat lethargic. All of the sudden the last two weeks his red blood count was starting to come up and this week, he had the best blood report he's had in the past few months, so I said, 'It's a go.' Going into the race, we felt his blood had to be better for us to run." Right: They got him under control and then he headed out for the post parade. Left: Ruler on Ice returns after the race with a smiling Jose Valdivia Jr. Valdivia said, "The owners, Mr. George and Mrs. Lori Hall, believed in me and believed in this horse. We hit the far turn, and we had a half-mile to go. I was sitting and I had a lot of horse underneath me. I looked up at the wire and was like, 'Oh my God, I'm going to win the Belmont Stakes.' At the half-mile pole, I was hearing whips cracking behind me and I could hear guys chirping to their horses, and all I'm doing is picking up the tempo. I still felt like I have a lot of horse under me. Turning for home, everything started going in slow motion. At the 1/16 pole, I thought, 'This is the true Test of the Champion.' It's a great feeling. He acts like he's something special, and I don't think we've gotten to the bottom of him yet." Right: Ruler on Ice would not let them put the flower blanket on him, although they tried several times. 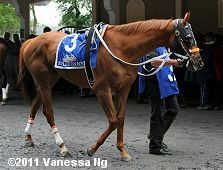 Left: Ruler on Ice in the paddock before the race. 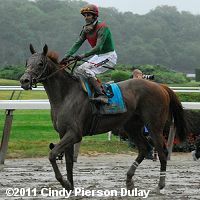 Trainer Kelly Breen said, "(Blinkers) was part of the maturity. He didn't mature as fast as we wanted to. He's already a gelding so we can't castrate him again, so we put blinkers on. The first time out of the gate, Jose was on him. He was still goofing off and didn't break great. Last week, he broke right and it's like sometimes, the bulb just goes on. It was a perfect storm of things going right, and that's how we got here." Right: Ruler on Ice heads back to the barn after the race. Left: Second place finisher Stay Thirsty heads out for the post parade. 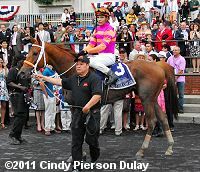 His jockey Javier Castellano said, "I have to give credit to the winner. He was impressive. He never gave up. 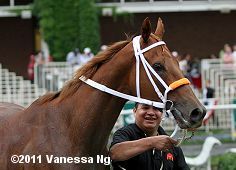 The way the race developed, Shackleford took the lead and the winner was second or third and we tried to stay with him. My horse responded so well today. I was very happy for him. He gave everything he had today. I couldn't ask anything more from him." 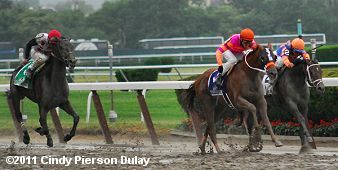 Trainer Todd Pletcher added, "The horse ran a super race. We were pleased. Of course, we would have loved to win this race. We are very proud of him. It was a great effort." Right: Third place finisher Brilliant Speed heads out for the post parade. 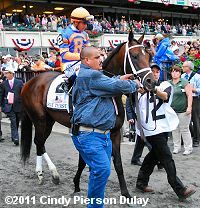 His trainer Tom Albertrani said, "He ran very well. It looked like he had it at the 1/8 pole. I thought he was going to keep coming with that run. Joel thought he was kind of looking around once he got to the lead, and that maybe he was kind of idling a little bit, but he ran well." 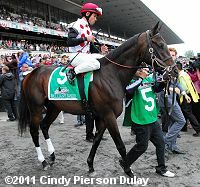 Jockey Joel Rosario added, "I had a good trip. He ran well. Turning for home he made the lead and he looked around a little bit. I think he ran a good race today. 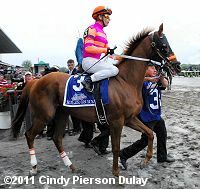 The distance is perfect for him and he did much better than in the Derby." Left: Beaten favorite Animal Kingdom returns covered in mud. 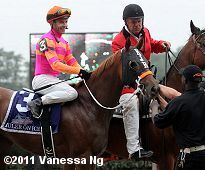 His jockey John Velazquez said, "They came over on me and clipped heels and I almost came off. I had a horrible trip. I was asking him for run way too much to be where I was from the 1/2 mile pole to the 1/4 pole. At that point, I was just hoping to get a piece of it and that's why I rode him that way after the start. No way he was going to make up that much ground. He's still a great horse." Right: The start of the 2011 Belmont Stakes. Trainer Graham Motion said, "(Animal Kingdom) almost fell down. Johnny couldn't believe the horse stayed up. It took him until halfway around the turn to get his foot back in the iron. It's disappointing not to give the horse a chance to run his race. I thought down the backside we didn't have any shot at all, and then he started to make that incredible move."